Elements cannot be undocked and moved outside the window area, but most of them can be highly customized and placed how you like within the window’s space. Like with 2D software, the ZBrush canvas has dimensions but is measured in pixols. The canvas can contain 2D, 2.5D and 3D elements. 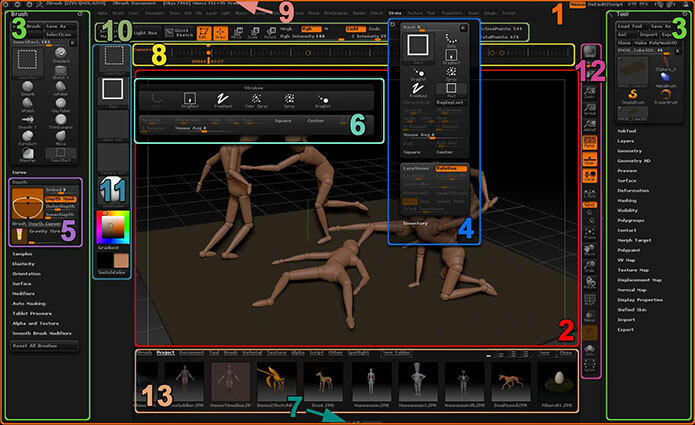 Unlike other 3D software, ZBrush doesn’t have a 3D space scene in which the camera (the user point of view) can be moved; instead 3D objects are manipulated in front of the camera, within the canvas. Think of the ZBrush canvas as being like a window within your house, looking out onto the 3D world beyond. Objects can be moved around outside the window, but you can’t move the window itself. This is a key element to understanding and being comfortable within ZBrush, and is actually part of the reason why ZBrush is able to work with millions of polygons in real-time. An animation package must track every element of your scene at all times, from all angles, regardless of whether something is visible to the camera at the moment or not. That’s a lot of system resources being reserved for scene management. ZBrush takes all those resources and focuses them on a single object, letting you do things that wouldn’t be possible in any other program. These are collapsible sections on the outermost left and right sides of the ZBrush window which can receive a single palette or several palettes stacked on top of each other. To open or close a tray, double-click the divider bar that separates the tray from the rest of window. By default, the right tray is open and the left one is closed/hidden. The user can drag a palette to the tray of their choice by clicking and dragging this small icon. To organize all the tools, utilities and settings, ZBrush has several palettes. Each palette is dedicated to a single set of related features. For example, the Tool palette contains all features regarding inventory and modification of your various Tools (including 3D models). These palettes are arranged in alphabetic order across the top of the window, right below the ZBrush title bar, where many other programs have their menu bar. You can also create your own palettes through ZBrush’s interface customization features. Also known as Menus, these are sub-headings within each palette, containing different actions, options and settings which can be applied to ZTools (3D objects, 2.5 Brushes, Primitives, etc. ), or to help with workflow. Like with palettes, new menus can be created and customized by the user. They can also be added by plugins. Please keep in mind that menus are context sensitive and can appear or disappear depending upon your current selections. For example, the Tool >> Adaptive Skin menu is only present when a ZSphere is selected due to the fact that the menu’s features don’t apply to any other kind of Tool. Another example is the SimpleBrush Tool, which doesn’t have any Tool settings. When it is selected, the Tool palette changes to have no menus at all. When clicking on some elements of the UI, a pop-up window appears which contains the corresponding functions related to the clicked icon. This example shows the ZTool pop-up window which contains the 3D primitives as well as the 2D and 2.5D Tools. Others important elements of the UI like the 3D Brush, Strokes, Alphas, Textures have the same kind of pop-up window. Any time you see a preview icon with contents that can change, clicking on the icon will trigger a pop-up window. Located at the very bottom of the ZBrush window, this tray can be expanded or collapsed just like the left and right trays. However, this tray can’t receive a palette like the others can. It is used by ZBrush only for ZScript or Tutorial purposes. Used for creating animation, saving points of view or creating SubTool visibility sets. By default, the Timeline is hidden. To show the Timeline, go to the Movie >> Timeline menu and click on the Show button. This is found at the very top of the ZBrush window. On the left side it contains the ZBrush version number, your hardware ID (It is not your license information and poses no security risk to display it in a screen shot!) and memory usage info. On the right are controls for palette visibility, the default ZScript (which reloads the default startup setup), the Help button, the interface theme colors and UI configuration presets. Depending of the interface that you have, you may have extra elements. For example, the Title Bar also contains icons for resizing and closing the ZBrush window, but their location changes depending on whether you’re a PC or Mac user. Also, different interface layouts can alter what elements are found on the Shelf and in the Trays. The following information is based upon the default layout that you’ll have when first launching ZBrush 4 after installing it. At any time, you can switch between UI configurations by clicking on the top right buttons that will cycle through several presets. This contains the main shortcuts to brush settings and ZTool manipulations. This area includes all the elements you will need on a regular basis to work on your model or painting: Edit mode, the Move, Scale and Rotate functions, the ZAdd or ZSub modes, the Size and hardness of the brush (Draw Size and Focal Shift), Z Intensity, access to important utilities (Projection Master, Light Box, Quicksketch) and more. This contains the main shortcuts to sculpting and painting elements: The sculpting Brushes, Strokes, Alphas, Textures, Materials, the color Picker, etc. These items all form the building blocks of what will happen the next time you click and drag on the canvas. This holds the controls for interacting with the canvas or a 3D model. The top section includes features for manipulating the CANVAS: zoom in/out, scroll, antialiasing, 10% view, etc. Below these icons are features for manipulating a 3D OBJECT (ZTool): Scale, Rotate, Move and essential elements for mesh visibility and the 3D workspace such as grid visibility, transparency, frame view, Polyframe (wireframe), perspective, etc. These latter buttons will be grayed out any time a model is not drawn on the canvas in Edit mode. It is important to remember that the top buttons affect your canvas as a whole, much like adjusting the zoom value for a picture in Photoshop, while the bottom buttons affect whatever model you are currently sculpting. This is your content library, which will let you browse between the ZTools, textures, alphas and more which are located on your hard drive. The Shelf: Surrounding the canvas there is a space to hold interface elements. Most anything that is found in the ZBrush palettes and their menus can be placed onto the Shelf. This allows you to place the features you use most where they are easily accessed around the canvas. (Separate documentation explains instructions for interface customization.) The default interface has a number of elements already conveniently placed for you on the Left, Right and Top sections of the Shelf. The Status Bar: Located immediately below the palette list, this area provides feedback as you work. For example, when setting a hotkey it will provide instructions on what to do next. When rendering your scene it will show a progress bar and provide other helpful information. Buttons: These interface elements are found within the palettes, as well as on the shelf. One example is the Tool >> Load Tool button. They appear as slightly raised items and are activated by clicking on them. Doing so executes the operation for which the button is named. Some buttons only have text, some have icons and some have both text and icons. Switches: These are used to select between related, mutually exclusive modes. An example are the Draw >> Mrgb, Rgb and M switches. Clicking on one selects that mode, causing it to highlight to show that it is active. If one of the related modes is already active, that one will turn off. If you click on an active switch it will turn off, leaving none of the modes active. Sliders: These allow you to set numerical values within a given range. For example, the Rgb Intensity slider allows values from 0 to 100. To change the value, click and drag on the slider. For a precise value, you can click once on the slider, type the desired value, then press Enter to set the value and deselect the slider. Swatches: These are small squares of color, found in various parts of the interface such as the Material >> Modifiers menu. Clicking on a swatch will set it to match the currently selected foreground color. Clicking and dragging from the swatch will change the cursor into a Picker. Continue dragging until the cursor is over a desired. For more information about palette and sub-palette operation see the Interface Operation page.